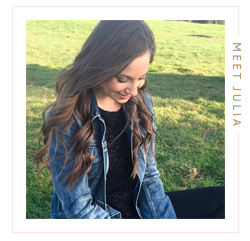 Becoming a vegetarian at the age of eight in a family full of meat-eaters gave me an early start at developing skills for eating out. Now, as a 26 year old vegan living in San Francisco, you'd think I'd have several friends who also avoid meat and dairy, making eating out a no brianer. I'm actually the only vegan/vegetarian in my group of friends, including my boyfriend, so my skills have only been further fine tuned. 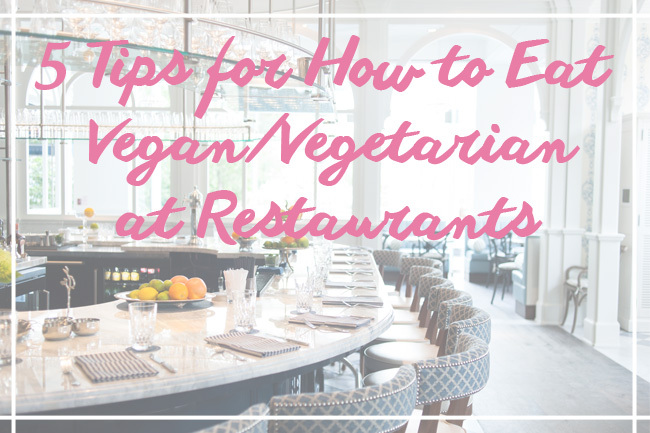 These are five tried and true tips for eating vegan or vegetarian out at restaurants that will help you avoid any potentially awkward situations and the dreaded hidden meat. 1. Review the menu ahead of time. So this one might seem like, well duh, but I felt like I needed to include it for those of you who are really new to the game. The majority of restaurants have a website you can visit to read their menu, and if they don't you can often find it on Yelp. Knowing what you're working with will ease any anxiety because you can spot the vegan/vegetarian options ahead of time and arrive already knowing what you want to order. The following tips address what to do if there aren't any clear meat/dairy-free options on the menu for you. 2. "I don't eat meat/dairy." Jack always laughs at me when I say this to servers but it's very effective. When you're asking for substitutions or accommodations with menu items, it's important to specifically let your server know that you don't eat meat and/or dairy/eggs so they take your requests and questions seriously. It's not uncommon to ask for, say, the roasted brussels sprouts without the crumbled bacon on top only to have it arrive with bacon all over it. Or even worse, be told the soup of the day is vegetarian only to find out it was made with chicken broth. Servers are trained to be sensitive to allergies, so explicitly saying you don't or can't eat meat or dairy cues a similar response to saying you're allergic to peanuts, for example, resulting in much more trustworthy dishes. 3. Avocado, avocado, avocado. But really...when is avocado ever not the answer? If I see a dish that looks delicious, but has meat or cheese as one of the main elements, avocado is often what I'll ask for to replace it. This works especially well in salads but can be used in many other instances as well. I love this substitution because avocado is also an expensive ingredient, so you don't feel like you're getting short changed, and for the obvious reason - avocado makes everything better. 4. Discover the secret menu items. Just because you don't see any items on the menu that are vegan/vegetarian right off the bat doesn't mean you're SOL. Take a steak house for example. To the untrained eye, dining at a steak house for a vegan/vegetarian seems like a recipe for disaster. I won't lie, it would not be my first choice of restaurants to go to, but if you've been invited to a friend's birthday party or company function, for instance, and there's really no way around it, you can easily get a delicious meat-free meal out of it. Restaurants, like steak houses, that don't list any vegan/vegetarian entrees on their menu 9.99 times out of 10 do have a mean veg option, all you have to do is ask for it. When the server comes around to you, say "I'm vegan and don't eat meat/dairy, what are my options? Can the chef make a veggie platter for me?" Believe it or not, they get this request a lot and will likely jump at the chance to accommodate you. 5. Supersize me, please. It's not uncommon for a menu to have several veg appetizer and side options, but when you scan down to the entrees it's meat, meat, fish, meat. Not a problem. Another tactic that I employ regularly is to ask to have one of the vegan appetizers or sides entree-supersized as my main dish. You can even order a few different appetizers or sides and ask that the restaurant put them all on the same plate so you don't feel like the odd one out. This type of request is a whole lot easier to ask for then, "I'll have the Chicken Parmesan but, can you use eggplant instead of chicken? And can I sub a side salad for the cheese?" It's also a lot easier for the kitchen to accommodate, meaning drama-free dinner for you and your fellow guests. Wow, love your tips here, so cool! Ah me too, I can't get enough! This is so interesting, Im not vegan... but Im picky, and still have to check the menu beforehand. I love these tips. I'm gradually cutting out meat and fish (hoping to eventually become vegan!) and have been anxious about what I'll do when it comes to eating at restaurants. These tips have honestly been really helpful to me. Thank you!